How can you build a Custom Tower for my boat without ever seeing the boat? Atlantic Towers was founded by an engineer. An engineer who carefully ensured that every project was fully documented and the technical information preserved from Day 1, over 26 years ago. The resulting library of designs and technical information enables Atlantic Towers to Custom Design and Build a completely engineered Arch or Hardtop for most any production powerboat without ever setting foot aboard. If your boat is not in our library, we can develop measurement diagrams for completion by customers or marine professionals for any boat, anywhere in the world. 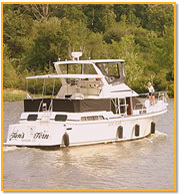 In this manner, we have completed successful projects on many boats we have never seen. These projects located around the world, Hawaii, Fiji, Japan, Italy, Australia just to name a few of the diverse locations. Here is what a recent customer in Curacao. N.A. had to say after he received his Custom Hardtop for his locally built boat. We received the boat top you made for us and have just one word "excellent" Shipping, packing, fitting and of course the look on the boat. Thank you and all of Atlantic towers who made this possible so far from each other. And of course our "Tower in a Box" product line allows a standard structure to be adjusted for a "custom fit" to any boat. Which is the best material, Aluminum or Stainless? 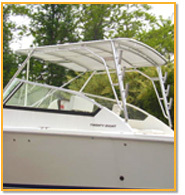 Atlantic Towers believes that aluminum is the "hands down" choice for boat towers of every type. For a given weight, correctly designed aluminum towers can be made much stiffer and stronger. Stainless steel weighs nearly 3 times as much as aluminum. Stainless steel makes great springs, not a desirable characteristic in boat towers. 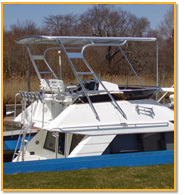 High end Boat Builders such as Viking, Bertram, Cabo, Hatteras and others equip their boats exclusively with aluminum railings, ladders, hardtop structures and towers because it is the best material choice. Won’t aluminum corrode in a salt water environment? Aluminum used in boat tower structures is normally finished with a process called “anodizing”. Anodizing is an electro-chemical enhancement of aluminum’s natural tendency to form a protective oxide coating. Anodizing provides a surface finish that is much harder, and much more resistant to cosmetic corrosion than bare metal. Anodized aluminum when given regular washing and waxing will look like “new” indefinitely. Aluminum has been used as a marine engineering material for nearly a hundred years. It is the material of choice for many durable commercial and military vessels, not to mention 100s of thousands of boat windshield systems, outboard motors and outdrives. If an aluminum tower has been “let go” how can it be restored?